The worst sufferings of humanity in certain parts of the world, especially African countries, have inspired the creation of hundreds of charity organizations by philanthropists. Many of such organizations have utilized the immense potential of internet to popularize their cause among the masses and fetch maximum donations. Here it is to be noted that as the quality of tools brings refinement to work of a carpenter, in the same way it is primarily the power of a web building tool that renders success to an online project. So, if you are also interested in contributing to such a noble cause and plan to launch an online charity organization project, here are top 5 charity themes that, having stood the test of time, are going to be popular in 2017 as well. What makes fully responsive Lifeline stand distinguished among other charity wp themes is its advanced payments system, i.e. 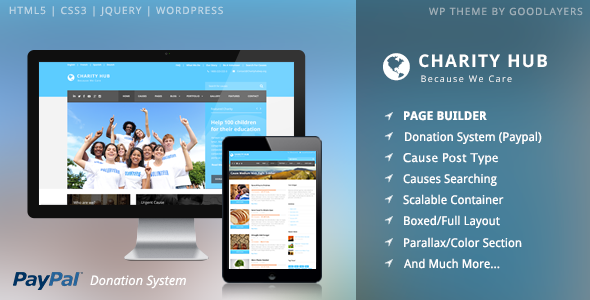 it is the only charity WP theme with integrated recurring payment system powered by PayPal. It means the charity organization would be able to facilitate the donors to make payments on regular basis, which may be either weekly, fortnightly, monthly, quarterly, half-yearly or yearly. However, it is not the only outstanding feature to be found in Lifeline premium WordPress theme—there is plenty of more at your very disposal! For example, the free of cost provision of premium WordPress plugins, including Visual Composer, Revolution Slider and Layer Slider, saves you as much as $63. Though Mission has been designed on the modern web building standards, it still lacks in the most wanted feature of recurring payment system. However, it can be provided through customization. Now let’s look at what is really appealing about the theme. One the first place, it is an economical product with advanced and unique accomplishments. Secondly, as you go to the Homepage, you will come across ultra sharp graphics, cool mouse-hover animations, perfect symmetry, amazing color combinations and enhanced readability. What you may not like about the product is the lack of multiple homepages. In addition, you won’t even find the slideshow creator and the popular Visual Composer page builder plugin. The non-availability of PayPal payment system can also be considered a serious shortcoming. 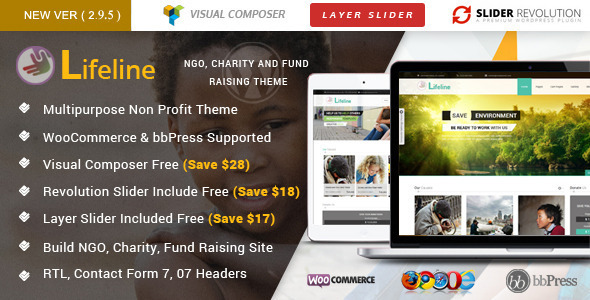 Powered with PayPal donation system, Charity Hub can be listed among the modern high quality themes. It has a plenty of innovative and unique features where the simple minimalist design is also of great appeal. The built-in Layer Slider saves you about $18 of your precious money. Though easy-to-use Visual Composer page builder is absent, you still have a page building tool. The parallax sections also add to its beauty. It also has WooCommerce support that can help convert your website into a perfect buying/selling platform. Indeed, it has 3 Home Page layouts but, Lifeline, on the other hand, has over a dozen unique homepage versions. Here is another marvelous web building tool for the modern charity websites. Like its counterparts, from other developers, it has been made fully responsive along all dimensions. However, you can also disable its responsive functionality. The customization is also easy but it is not as quick and fun-yielding as found in Lifeline. There is a ‘donation ticker’ and ‘call-to-action’ button but, unfortunately, you are not provided with PayPal and recurring donation system that is the very need of the day. Another serious drawback is the unavailability of the slideshow creator, like Layer Slider or Slider Revolution which, if given, would have made a great deal of contribution to its worth and appeal. 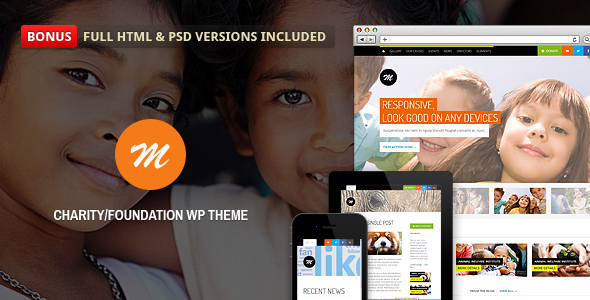 As the very name suggests, DonateNow theme is meant for the donation and charity related projects. It is neat, clean, flexible and retina ready with on/off button for responsiveness. Being a multipurpose product, it can also be used for other niches, like corporate, blog, products and portfolio. The intelligent admin panel ensures easy setup and quick customization. The built-in Layer Slider slideshow creator plugin saves you a significant amount of $18. At the same time, you will be disappointed to note that it lacks in a variety of Homepage layouts as found in Lifeline. But you need not worry as the Visual Composer plugin is there that will help you create as many more home pages as you want. The built-in SEO is also something great. All the above described products are among the best charity website themes that owe their appeal to the advanced designing techniques and powerful functionality. Even then, if you carry out the comparison and contrast of all these themes, you will realize that Lifeline is the best one. On the first place, Lifeline has over a dozen homepages and a large number of single pages, each powered with all the essential features. Secondly, the premium built-in plugins, like Revolution Slider, Layer Slider, and Visual Composer save you as much as $63. Thirdly, it is the only theme with recurrent payment system and PayPal integration. Still there are a lot of other things that you can find nowhere else. The final choice is anyhow yours.